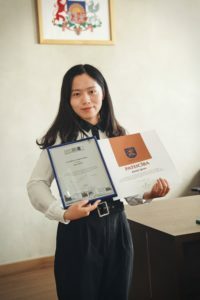 Local time 19th of June, Rezekne City Government and Rezekne Academy of Technologies awarded Gratitute Letter to Volunteer Chinese Teacher Zhao Qian ,praised her spirit of diligence and dedication and outstanding contribution to Chinese teaching. Rezekne Academy of Technologies was established in 1993 on the basis of the branches of the University of Latvia and Riga Technical University. It is a state founded higher education and science institution of the Republic of Latvia, which implements the study programs as well as is engaged in scientific, research and artistic creative work. Chinese course of the university was started in September 2013. It is the first one in Rezekne area. In September 2015, Chinese teaching progam in Rezekne Academy of technologies was upgraded into Confucius Classroom by Hanban/Confucius Institute Headquaters, thus becoming the third Confucius Classroom affiliated to Confucius Institute at University of Latvia. In August 2016, Zhao Qian was dispatched by Hanban/Confucius Institute Headquaters as the Chinese teacher here.In September ,Zhao Qian worked as host of the unveiling ceremony of Confucius Classroom. Till June of 2018,Zhao Qian haved worked here as Chinese teacher for two years,she got outstanding teaching achievements and deeply loved by students.Before the ceremony,Zhao Qian made a job summary and gave some advice about future developement of Confucius classroom. The rector of Rezekne Academy of Technologies Edmunds Teirumnieks affirmed Zhao Qian’s contribution and awarded Gratitute Letter to her on behalf of Rezekne City Government and Rezekne Academy of Technologies.